Alcala has been an important settlement for a long time, as we have explained to you in our previous post about the history of Alcala. What we haven’t explained yet is why the city developed here, what this location had that made and makes it a good place to live in. Back in the hunter and gatherers’ period, people moved from one place to another looking for two things: food and water, and Alcala had both of them. There was plenty of water because of the existence of a river, called Henares, and two tributary streams, Camarmilla and Torote; and there were enough animals to hunt and wood on the hills (El Viso, Ecce Homo, … ) to make fire with. The arrival of agriculture boosted the population in the area, and since the land was flat and fertile, the region was soon able to feed and support large communities. 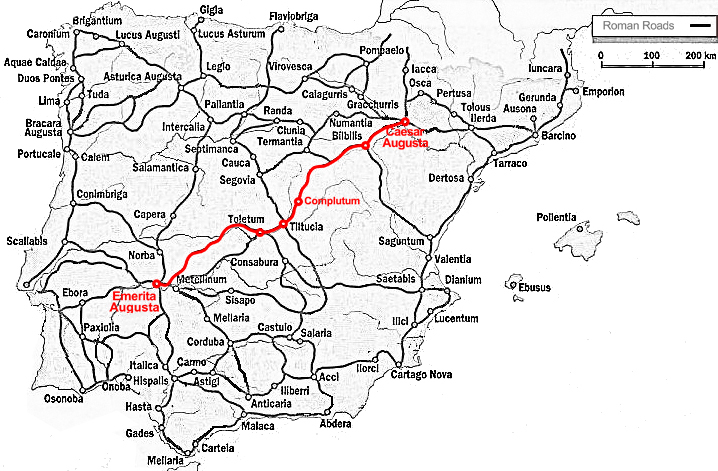 During Roman Times, in order to settle themselves in a certain place, people wanted to be connected to the network, just as we do now, although the existing network back then was simpler, and it consisted of a group of Roman roads that crossed Spain from North to South and from East to West. As you probably already know, the center of Spain is a large plateau, which is divided by a mountain range (Sistema Central) into two parts: Submeseta Norte and Submeseta Sur, with other mountain ranges separating the Submesetas from the Ebro Valley(the Sistema Ibérico) and Guadalquivir Valley (Sierra Morena). There weren’t many easy crossings in all these mountain ranges, and being located in or close to one of the them was a big deal. 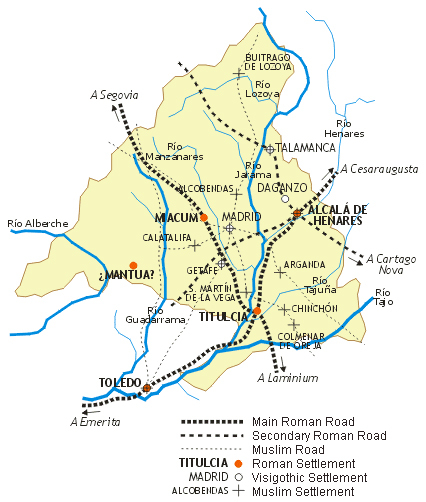 Alcalá was conveniently situated and was therefore lucky enough to be in the middle of the Roman road which linked Emerita Augusta (the current Merida, on the South Plateau) with Caesar Augusta (Saragosa, in the Ebro Valley) and further on to Tarraco (Tarragona) and Rome. To be more specific, Complutum emerged as a wealthy city because of its being located close to the river Henares, which flows smoothly through the South Plateau making the road along the river an easy route for travelers and merchants. What happened afterwords, you already know (in case you don’t, check out our previous posts about the History of Alcala here and here). The martyrdom of Santos Justo and Pastor, a.k.a. Los Santos Niños, took place in Complutum and years later their remains were found. The Archbishop of Toledo commanded a chapel to be built on the site of their remains, which would soon become a cathedral, and people came to live here, where the modern city grew. Cisneros boosted the city by founding a new and soon to be important university (Complutense University) which brought money, students and artists. Many of the most important writers and philosophers of the Spanish Siglo de Oro studied in this university, and even the first Spanish grammar was printed here. 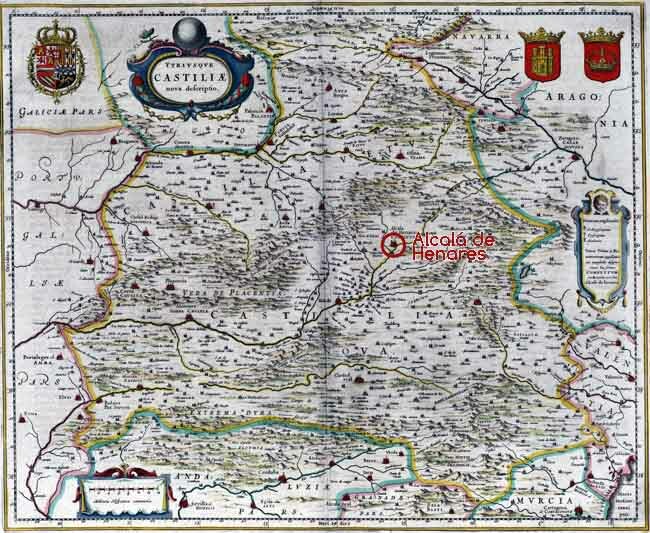 A turning point in the history of Alcalá was 1561, in that year, the king Felipe II settled the Court in the nearby village of Madrid, granting it the title of Capital of Spain. With Madrid so near Alcala, little by little, Alcala began to lose importance as well as population and some institutions in favor of Madrid. Although the cathedral remained in Alcala (it wasn’t till the XIX when Madrid built a cathedral), the university progressively lost its importance, and finally Madrid even took it away, even keeping its name, in 1836, as we have already told you in a previous post… sad memories. 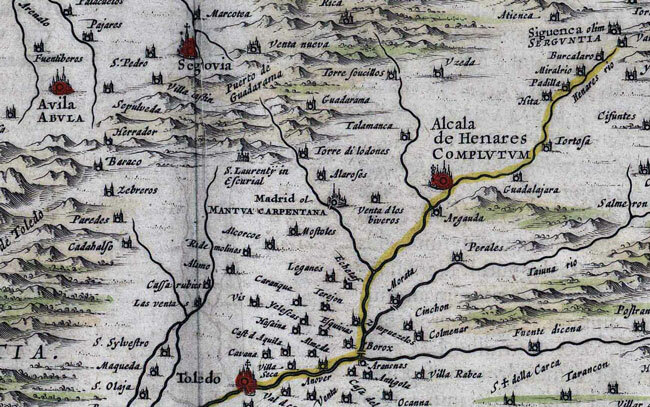 This is proof that I’m saying the truth: here is a map where Madrid is almost impossible to find but Alcala is very prominent, a map made by Joan Blaeu in 1635. This is not the only map that exists from this time, and it is impressive that it was drawn when Madrid had close to 30.000 inhabitants. This understated drawing is a little bit unfair for them, although there was a reason for that: back then, Alcala de Henares was more important than Madrid. 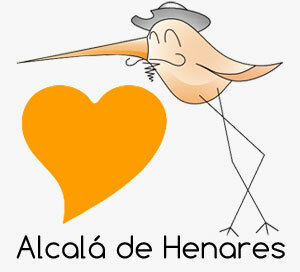 Click in here to download the complete map of Castile and try to find Alcala, which is easy, and Madrid, which is not. 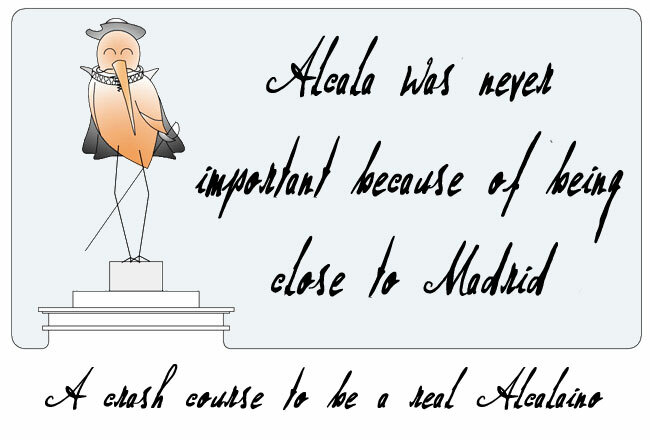 Never forget it and be proud of the fact, that Alcala was never important because of being close to Madrid. We have our own merits.